As mentioned in the last two posts, I’m working on a series inspired by the Medieval view of the planets and cosmos – a complicated yet harmonious and imaginatively inspiring view of the ‘heavens’ as they were known. 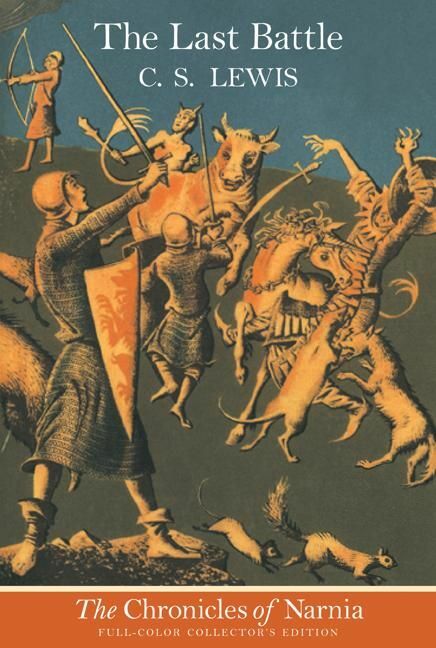 I’m cu rrently reading Michael Ward’s ‘Planet Narnia’ in which he describes and explores his discovery that each of C.S. 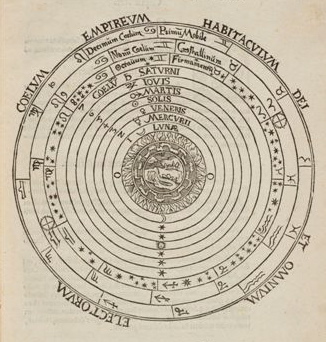 Lewis’s Narnia Chronicles correspond to each of the seven planets. Sol (Sun), Luna (Moon), Mercury, Mars, Venus, Jupiter and Saturn. (Neptune, Uranus and Pluto weren’t viewable with the naked eye). ‘Planet’ meant ‘wandering star’, so they classed the sun and moon as planets in that sense. These were the objects in the night sky that moved in regular patterns, against a fixed, un-moving backdrop of stars, which were mapped into recognisable patterns or constellations. This was a world-wide practice of course, given that watching planets and stars enabled people to predict seasons, or navigate seas and so on. 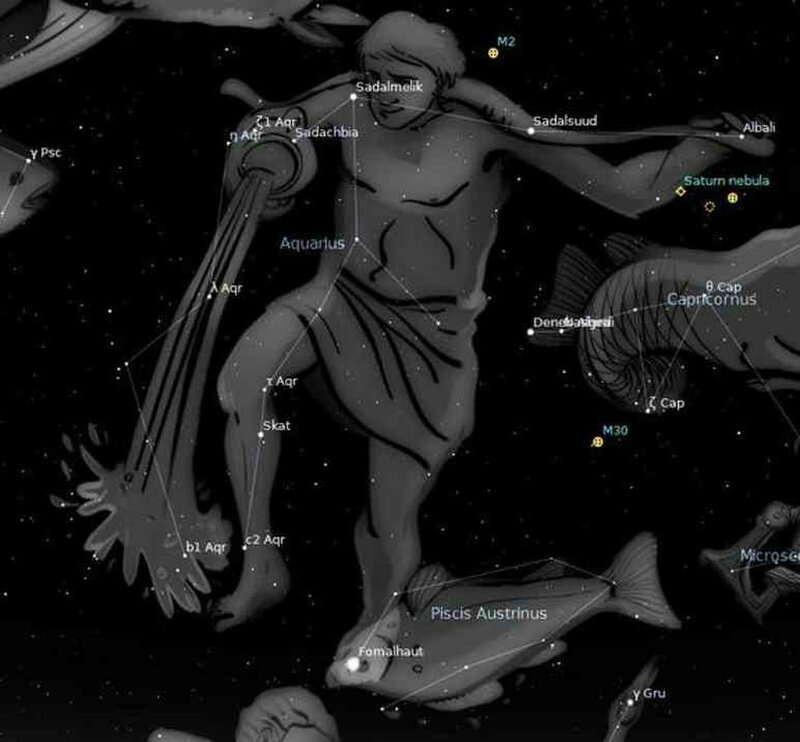 Names of the constellations varied around the world, but it’s fascinating to read about the equally varying myths that surrounded, for example, constellations such as Orion. I’m exploring western ideas and mythology for now though, which is enough to be going on with! My tiny mind is currently absorbing a wealth of complicated information about the Medieval view of the cosmos, from a variety of sources – not just Michael Ward’s excellent book, but also books, ideas and explanations suggested by several people I’ve encountered in the last five months or so. Precisely why it fascinates me so much I’m not fully able to explain even to myself as yet, but the mythology is enchanting, and if nothing else I’m learning to recognise constellations. 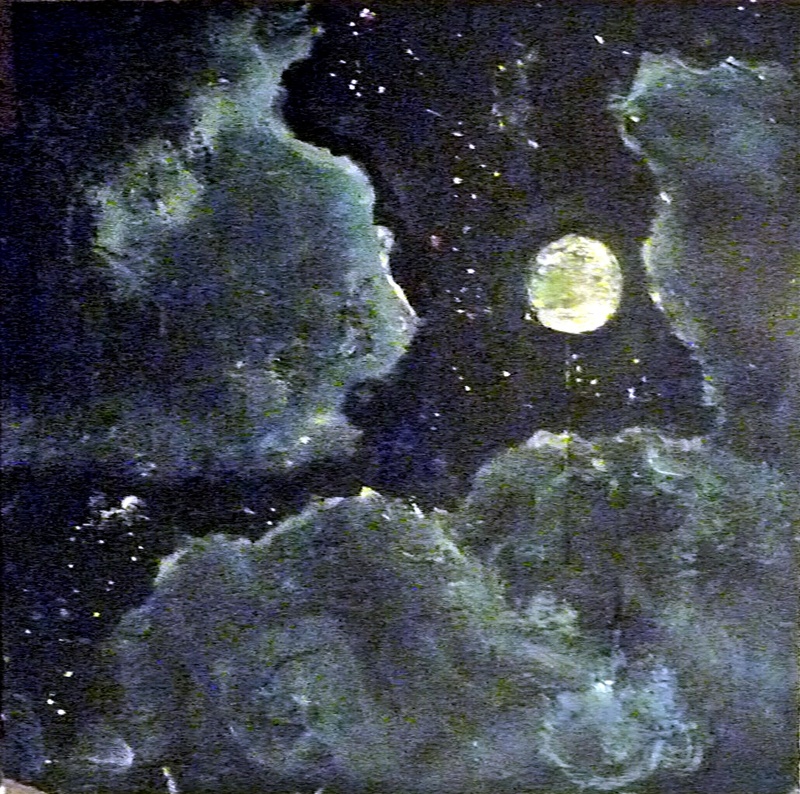 (Incidentally, star gazers might recognise the two appropriate constellations in my painting above). My exploration has taken me ‘around the houses’ as it were, and led me back to the Narniad I suppose, but by way of explanation on how I became interested ..
Back in September, I took a trip with a couple of friends to Roslin Chapel outside Edinburgh (famous these days for its association with the Da Vinci Code!) I’ve been there many times of course since it’s a short drive from Edinburgh, but this time it was (bizarrely, by my usual standards anyway) in a chauffeur-driven limousine, and our driver happened to be a Grand Master in the Freemasons. I’m cognisant of all the conspiracy theories around Freemasonry, but I think if there is some sort of Illuminati elitist group at the head of the organisation I can safely say our driver wasn’t in on it, as far as I know! 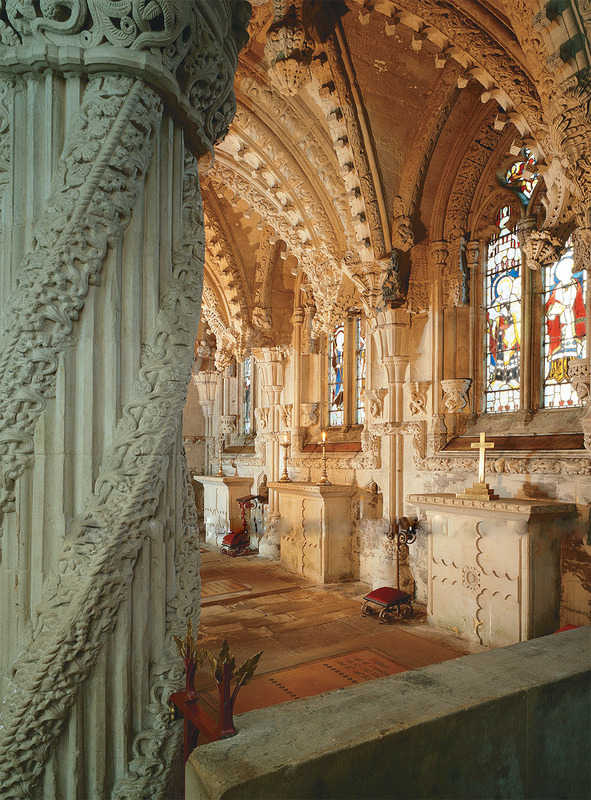 I could also digress into my view that such a system has it’s dark side in terms of undue influence, but suffice to say, I was typically just very curious as to what he might know about Roslin Chapel (also known as Rosslyn) given its connection with freemasonry since Medieval times. He simply said ‘have a good look at the crypt’, which I did. 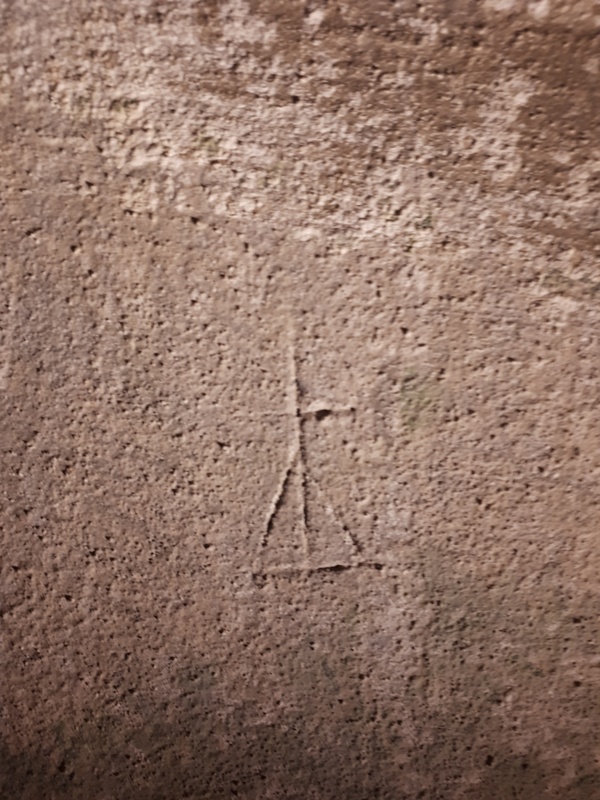 The chapel has an abundance of symbology and beautiful stone carvings, but the crypt is relatively very plain, what I did notice were all the rough markings and symbols that had been graffiti-ed onto the walls. So I took several photos and later showed them to our driver on our way back to Edinburgh. He explained that most of these were simply stone masons marks, they helped the overseer to tally up which stone mason had worked on a particular area, and for how long etc. This seemed to me a very prosaic explanation, but I’ve no doubt it’s partially true. The symbols themselves though, spoke of a more ancient system of knowledge – pyramids, circles, inverted or overlayed triangles and so on. My eye being tuned in to these symbols, on the way back to Edinburgh I saw them carved into old walls and ancient kerb-stones everywhere, it was surprising I hadn’t noticed them before but that’s syncronicity of course. A search online didn’t yield many results, and mostly led to fairly tedious reports by freemason organisations, or varying conspiracy theories. I already knew the history of the Knight’s Templar (and their connection with Scotland) which is easily findable online, but it was clear to me that freemasonry involved symbols and practices related to occult (hidden) knowledge. Given the organisation’s Medieval origins I began to search for Medieval occultism. This research happened informally over a couple of weeks, just something I’d have a look at in spare moments, then one day I was sitting in a taxi on my way to an event (I don’t normally get chaffeur-driven rides around town, or habitually catch taxis, but I was late that day, hence the taxi, and the chauffeur thing was simply that a friend had won it at a charity auction). I can’t now remember how I got into a conversation about freemasonry with the taxi-driver, but he spoke about his former affiliation with them, and the fact he’d decided to give it up since he felt (as I do) that it leads to un-due or unfair influence. In his case this was in a low-level way, regarding the police, in a situation where he knew he’d benefit from the connection, but admirably chose not to. He felt that though the organisation was committed to some genuinely helpful charitable causes it could lead to corruption. Anyway, after I’d asked him a few more questions he said ‘Read Heinrich Cornelius Agrippa, and take note that he was an early feminist’. This was intriguing, but I didn’t rush out to buy it, as I felt I was probably just meandering down a route that would lead to vague ideas of out-moded magical or theological thought, which it has in a sense, but this is my art diary, so I’ll continue to indulge my explorations here! I looked up information about Agrippa online, and discovered a fairly eccentric practitioner of occultism living in Texas whose videos and articles went into some depth about what he termed ‘classical Renaissance magic’. I’m not particularly interested in becoming a magician, but clearly he knew his stuff, so I emailed to ask him about Agrippa. Despite the fact he was, no doubt, an evil Satanist, he politely and in friendly manner answered my query and asked why it was I was interested, and what I hoped to achieve through practising classical magic. I replied that if anything I’d quite like to be a better artist, or to perceive more meaningfully, but in the meantime I was just curious about the subject. He replied that the clear place to start in any such endeavour, is to read Agrippa’s Three Books of Occult Philosophy, and that understanding the planets or Medieval view of the cosmos would probably actually be a good way of perceiving the world and becoming a better artist. As it turned out, he was in fact Christian, but felt that these studies enhanced spiritual practice or understanding. (one thing he has in common as it turns out, with C.S. Lewis). (Tangentially, any female readers of this post might feel that this is a very male-oriented world I’m describing. It certainly is, and this is something I’ll explore more fully later, when I create a Venus related painting later in the year. Venus – planet of love and classed as female – is probably the most complex planet in terms of its mythology – presumably because love is the most complex, transcendent yet painful experience or endeavour). I then ordered Agrippa’s Three Books of Occult Philosophy and because I was heading off to Iona for a two week artist’s residency at the Iona Youth Hostel at Lagandorain, decided to take it with me. My magician friend had recommended I read just one chapter a day, meditate on it, live with it and see what ideas or experiences came up. Dipping randomly into the book, it also explored the planets, and influence or phases of the moon. 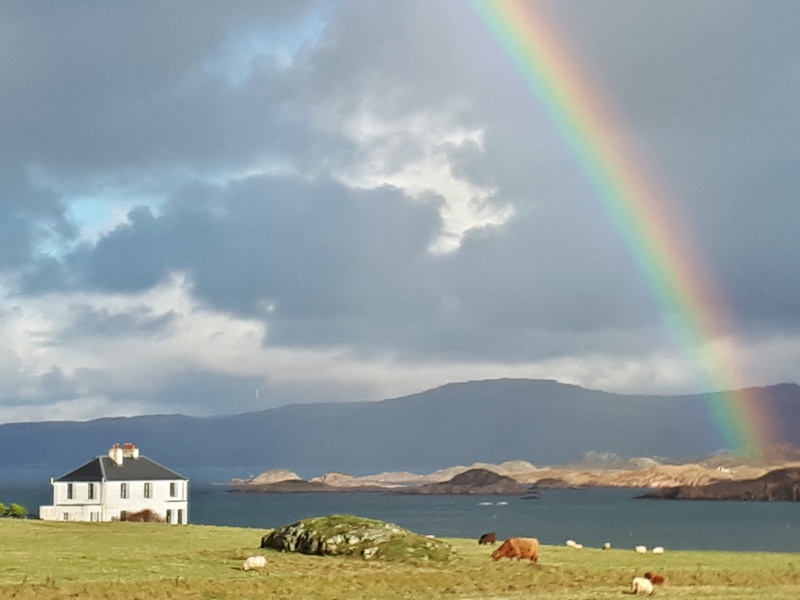 Chatting about this with the manager at Iona Hostel, he mentioned that he used a mobile app called ‘Skymap’ to observe phases of the moon, also that on this evening the moon was entering full moon phase, and going from Pisces to Aries. I forgot all about that, carried on with my painting, then, at about 5:20, went to clean up and have a lie down for half an hour. I couldn’t rest though and after ten minutes, feeling emotionally agitated and restless, I decided to take the two minute walk to the north beach of the island. If you’ve observed the sea at high tide, or during changes in tide, you’ll maybe have observed the strange shifting effect – it looks almost hallucinogenic. I stood entranced, gazing at the sea for half an hour until it got dark, then returned to the hostel, checked the Skymap app and realised that the moon became full at precisely 5:45pm. I’d walked on to the beach at about 5:40pm! 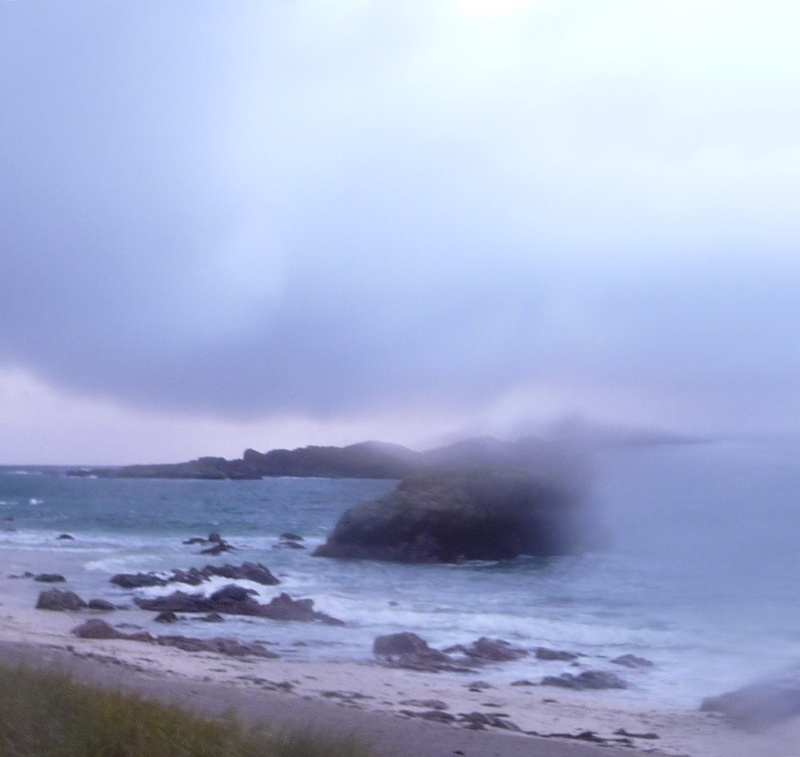 North Beach Iona. Photo, Rose Strang October 2018. It was an interesting experience; a reminder that the moon does cause the tides, and that we too are made up largely of water. I’m not so particularly interested in the science behind this at present (some of which I know) For my purposes I’m more interested in lived experience and observation, so this felt valuable to me as an artist. 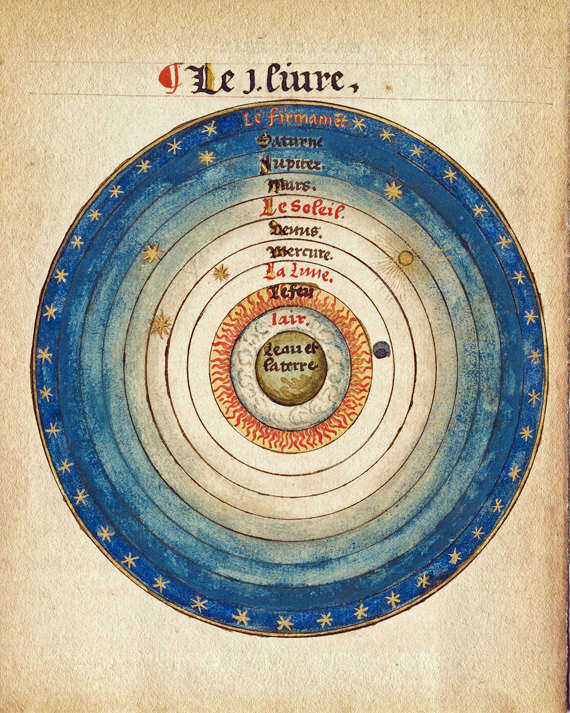 Medieval philosophers believed that the cosmos had three levels; the heavens – beyond the planets, where the gods resided, or ‘the divine realm’, the celestial realm where the planets resided, and the earth where everything was a reflection of the heavens. Anything beneath the moon is termed ‘sub-lunar’ and the gods are separate from this realm, but Medieval philosophers believed we connected with them through energies of the celestial bodies – planets and stars. The term ‘as above, so below’ refers to the idea that on earth, everything (plants, animals, stones, minerals etc) is a reflection of the heavens. They classified these physical things according to each planet, then each planet connected to the divine realm – the planets were in a sense ‘go-betweens’. So, to evoke their influence by using a talisman (i.e. objects/plants/minerals etc related to a particular planet) you could bring that planet’s influence to bear on your life or events. That’s it very briefly for today, but since my current painting related to Saturn, below is a very brief description, or flavour at least, of its qualities and related things on earth. In the next post I’ll explore the mytholgy surrounding Saturn, and C.S. 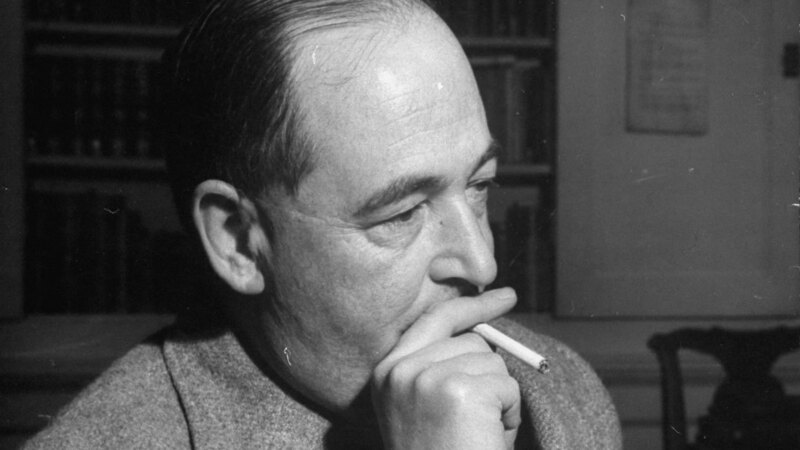 lewis’s literary treatment of it in ‘The Panet’s Trilogy’ and ‘the Last Battle’. Qualities and associations: Time (father time), structure, form, renewal and liberation, brooding, melancholy, death, the occult (hidden, veiled, secret), teaching, pedantry, oppression, rules and boundaries. Earth, water, lead, all ‘dark, weighty things’, ‘those things which stupifie’, dark berries, the black fig tree, pine, cypress, trees used at burials, owls, crows, animals that live by night. 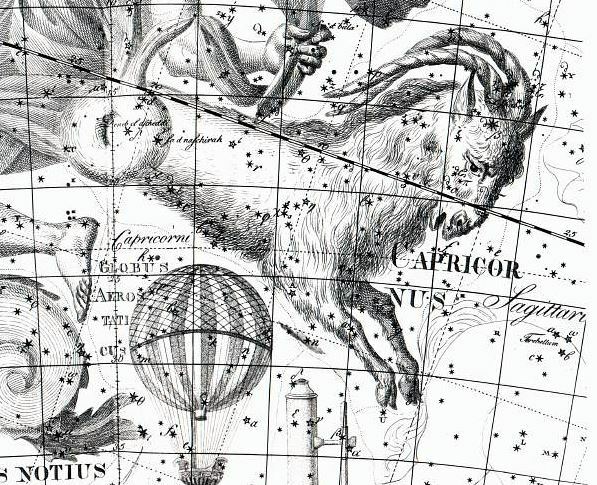 Zodiac signs of Capricorn and Aquarius. Roman feast of Saturnalia: held at winter solstice on 21st – all people celebrated, executions were cancelled or postponed, gifts were exchanged. This entry was posted in Uncategorized and tagged medival cosmos, night paintings, Saturn, star paintings on January 19, 2019 by rosestrang. I was standing today in the dark toolshed. The sun was shining outside and through the crack at the top of the door there came a sunbeam. From where I stood that beam of light, with the specks of dust floating in it, was the most striking thing in the place. Everything else was almost pitch-black. I was seeing the beam, not seeing things by it. Then I moved, so that the beam fell on my eyes. Instantly the whole previous picture vanished. I saw no toolshed, and (above all) no beam. Instead I saw, framed in the irregular cranny at the top of the door, green leaves moving on the branches of a tree outside and beyond that, ninety-odd million miles away, the sun. Looking along the beam, and looking at the beam are very different experiences. As mentioned in yesterday’s post, I’m painting a new series inspired by the classic Medieval view of the universe, in particular the planets. It’s a complicated picture and (though scientifically inaccurate!) quite beautiful in its imagery, mythology, associations and sense of unified harmony. The above quote by C.S. Lewis (left, enjoying a cigarette – absolutely unacceptable in these times!) is a wonderful illustration of his way of explaining philosophical concepts through lived experience and imaginative observation. It’s probably one reason for the enduring appeal of his Narnia Chronicles and writings on Theology. Lewis had read the philosopher Samuel Alexander’s theory of Enjoyment and Contemplation, which crystallised ideas he’d been exploring. The quote above illustrates the difference beautifully; contemplation of the beam of light is a different experience to being in the beam of light – you’re no longer looking at light, you’re in it, or in other words experiencing it subjectively (enjoyment) not objectively (contemplation). For Lewis this concept informed his writing and way of life. It’s well-known that Lewis was a committed Christian (incidentally if it’s of interest this is not how I’d describe myself – I’m not a member of any religious group, though I find Lewis’s exploration of Christianity fascinating and inspiring). As an academic he specialised in Medieval and Renaissance literature and one of his expressed regrets was the way that Medieval myth and imagination had been sidestepped or rejected by later religious practice or theology. It wasn’t just that he found Norse, Roman, Greek, Hindu (or any source of ancient mythology) fascinating, he also felt as a Christian that exploring these myths, or finding them spiritually inspirational was as valid an aspect of worship as following Christian religious doctrine. Similar to Blake in some ways, he profoundly appreciated the power of imagination – for Lewis this partly informed ideas about Enjoyment, as opposed to Contemplation. 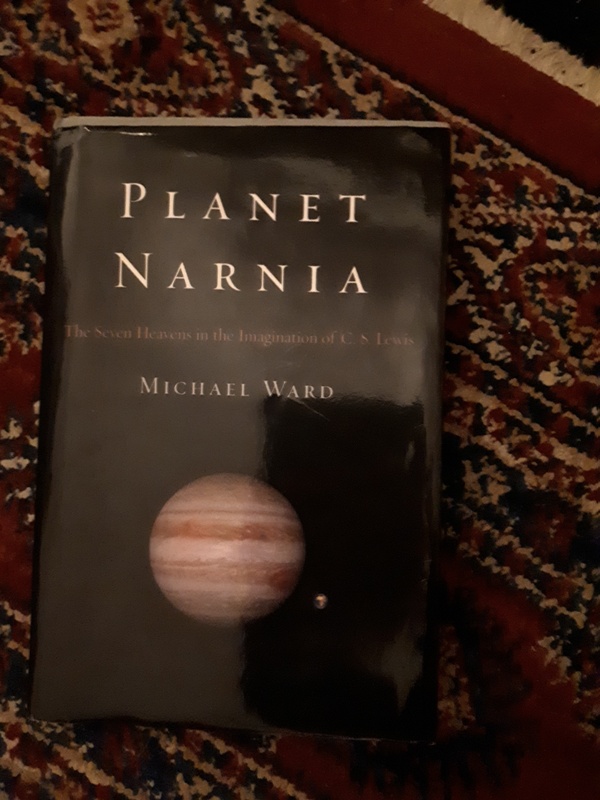 At the moment, I’m reading Michael Ward’s Planet Narnia, (for which I’m grateful for providing much of the information about Lewis described above) in which Michael Ward describes and philosophically explores his discovery that each of the Narnia Chronicles was in fact inspired by the seven planets as understood from a Medieval perspective. C.S. Lewis never stated this as his partial inspiration at the time, though in retrospect, once explained, it’s startlingly obvious. It is as he states himself, surprising that he was the first person (publicly at least) to recognise it. My painting in progress (at the top of this post) is the first in a series of seven I’ll be painting this year. I’ll write more about the inspiration as I go, but this one, titled ‘January. 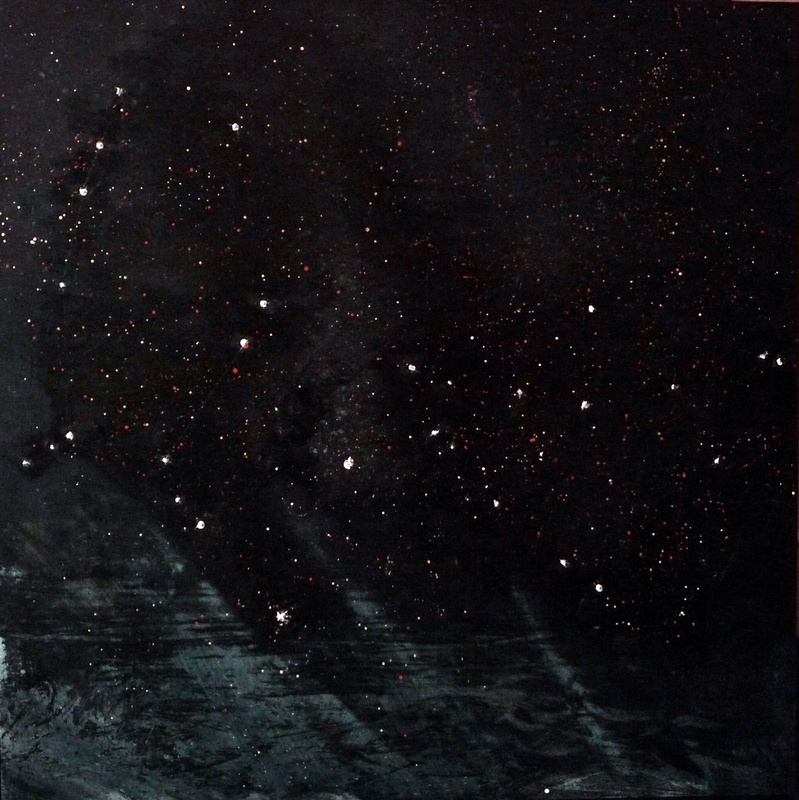 Nightscape’ is inspired by the planet Saturn – a somewhat dark and heavy energy by all Medieval accounts! I’ll write more about Saturn and its influence according to Medieval mythology as the painting progresses this month. Of interest to C.S. Lewis appreciators, the correspondingly Saturnine Narnia book is ‘The Last Battle’ (last of the series). 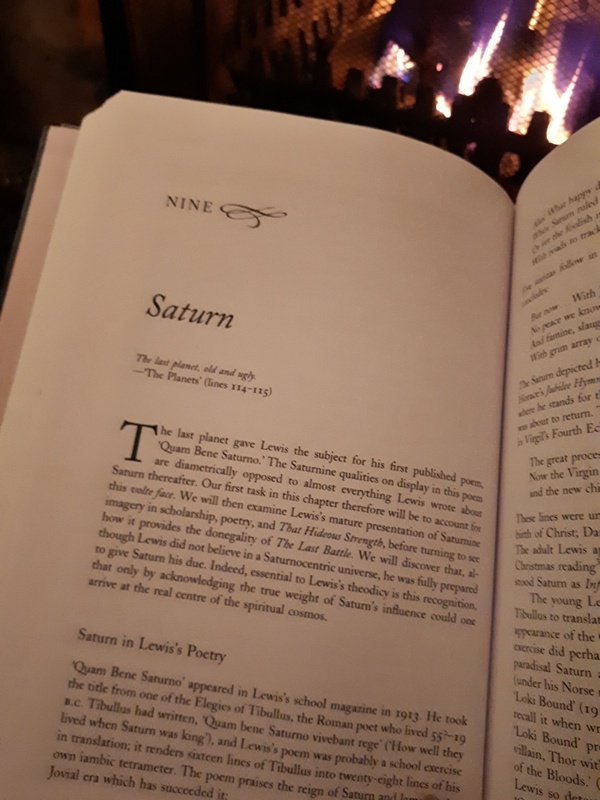 Lewis, in keeping with the quote at the top of this post, doesn’t mention Saturn (as far as I recall) in the book, but the book is saturated with its influence throughout. I’ll explore this more as my January/Saturn painting develops. These dark January days, I’m finding it therapeutic to light the fire, of an evening, switch off all the wifi, mobile and other distractions, and immerse myself in a book. I also really enjoy keeping an arts diary (this blog) as a way of recording my inspirations. 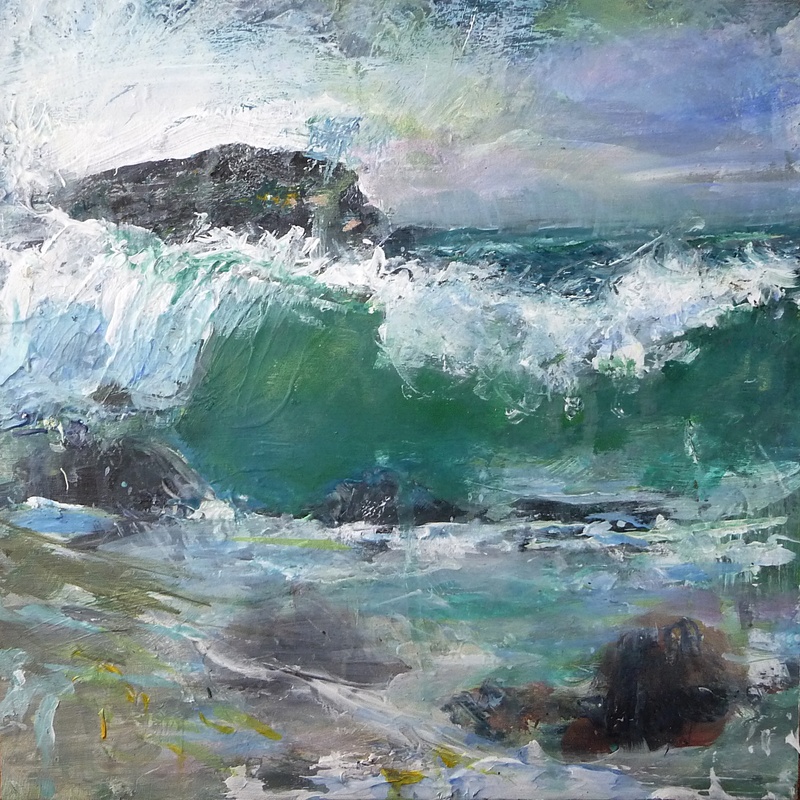 Also, on a pragmatic note, the resulting paintings will be for sale in the galleries that currently represent my work, namely the Limetree Gallery (Bristol), Resipole Gallery (Acharacle, Scotland) and Morningside Gallery (Edinburgh). I appreciate their support, also the supportive creative ethos of these galleries to artists they represent. In the meantime, Happy January to readers of this blog – it is indeed a dark month here in the Northern hemisphere, I hope you’re finding ways to enjoy it! 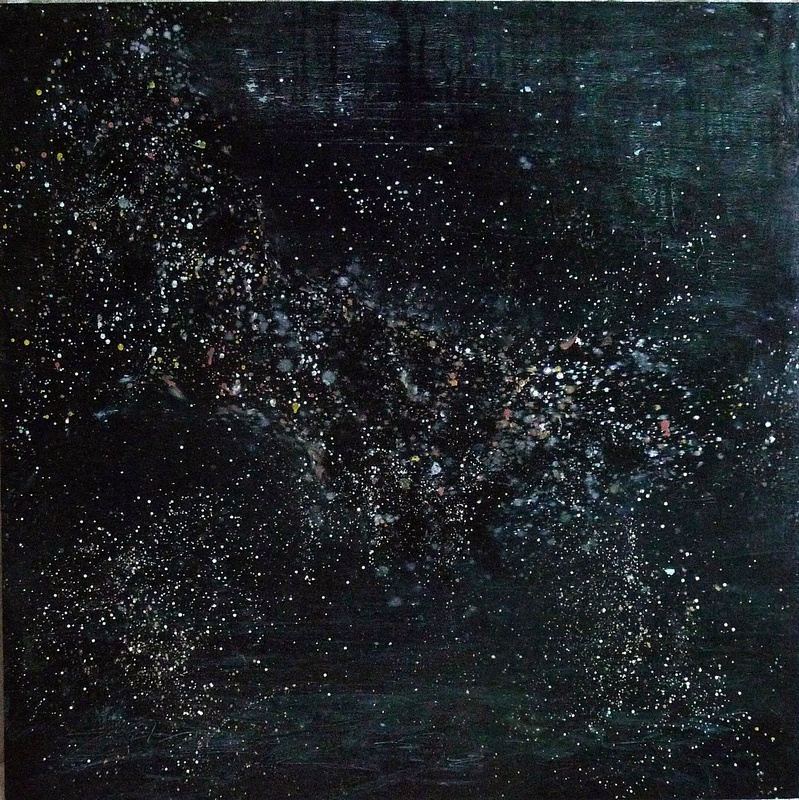 This entry was posted in Uncategorized and tagged black paintings, C.S. Lewis, night paintings, nightscapes, star paintings, the last battle on January 17, 2019 by rosestrang.